In the 7th episode of Thundercats, Lion-O is transported into the Book of Omens. Through the book, he becomes Leo, one of his ancestors. As Leo, he experiences the full power of the Sword of Omens, the gauntlet and Mumm-Ra himself. Did this wind up being the best episode of the young series or its first stinker? Lion-O is attempting to unlock the secrets of the Book of Omens while the other ‘Cats rest and train. As he is fiddling, he is struck by a power surge from the book itself that renders him unconscious. The book then takes his essence and transports it into the book itself. Once inside, he meets the essence of Jaga, who tells him that the book is beyond magic or technology. Through the book one can actually live out the past. Jaga place Lion-O into the body of his ancestor, Leo (the Lion-O look-alike we saw in last weeks flashback). But Jaga warns Lion-O that if he deviates from the true events, the book will be locked to him forever. Ok, to save some time here, let’s do a quick rundown. Leo is on Mumm-Ra’s tomb-ship, they are looking for the “war stone” (aka the Eye of Thundera).The Cats are working with Mumm-Ra (we knew that from last week). We find out that Mumm-Ra and the Cats have enslaved many different animal species (including the TigerSharks!). We then find out that Leo is working with a female cat, as well as the leader of the Jackals and the Lizards to form a rebellion. 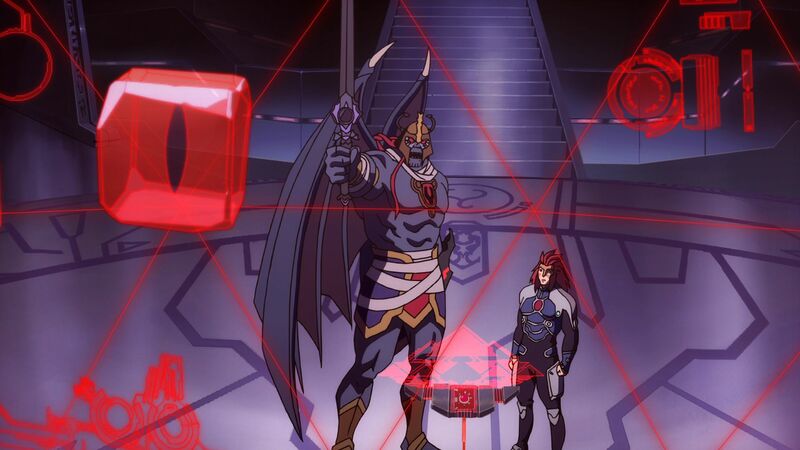 It all hinges on Leo defeating Mumm-Ra after obtaining the “war stone”. We then see some rogue Cats forging the Sword of Omens. they hand that and the claw gauntlet to Leo. Once Tygrus comes aboard the ship they are on, Leo confiscates the war stone and embeds it into the Sword of Omens. He goes off to attack Mumm-Ra. During the fight, Mumm-Ra reveals three other stones that power his own gauntlet and the Sword of Plun-Darr. As the fight continues Mumm-Ra uses those stones to turn his gauntlet into a suit of armor. Leo, having stolen one of the stones from Mumm-Ra, uses it to transform his gauntlet into its own suit of armor. After a huge battle, Leo eventually prevails. By removing the stones from Mumm-Ra’s gauntlet, he reverts him back to his “mummy” form. Leo frees the animals, Mumm-Ra retreats into his sarcophagus (the one Grune freed him from) and the ship is being pulled toward a strange planet (Third Earth). The female Cat disables Mumm-Ra’s sarcophagus, so it can’t be opened by him. As they all prepare for a crash, Lion-O is pulled from Leo’s body. Jaga again meets with Lion-O, telling him the stones were scattered throughout Third Earth. Lion-O realizes he must unite all the animal species and find the stones to defeat Mumm-Ra. Lion-O awakens, as the team stands by him, and he informs them he knows what has to be done. Ok, that was a surprising and very revealing episode. So all the animal species that we have seen are not from Third Earth, which is a major revelation. Having the gauntlet function as something more than a holster is quite a nice take on that piece of Thundercats lore. It was nice to get some major back story elements filled in. The story is being carefully weaved and it’s exhilarating to watch it unfold. By intertwining Mumm-Ra and the Thundercats as, originally, allies, it gives so many opportunities for even further flashbacks. But allowing us to witness the rebellion gives us just enough for now, especially since it answered so many questions about the Eye of Thundera, the Sword of Omens and more. The fight between Leo and Mumm-Ra was also a great taste of things to come. By the end of the season (or maybe even next season), when Lion-O obtains one or more of the stones, those battles with Mumm-Ra will be epic. There were a few negatives to be found though. The episode sets up the three Macguffin’s (look it up if you’re not sure what that means) for the first season, if not the series. I’m not a big fan of the blatant use of the Macguffin gimmick, but so far the series has handled that aspect with care. Plus we’ve had a few episodes in a row now that are relying solely on flashbacks to tell the story, and if that keeps up, it will wear itself out quickly. We’ll see how it plays out though. This was a very enjoyable episode. It had the makings to be the best of the series so far. But, by so blatantly spelling out the quests of the next few episodes (or the entire season), it kinda broke the smooth flow the episode had going for it. However, a lot of our questions were answered, even ones that I wasn’t expecting to ever have answered, like the origin of the Sword of Omens. Add that to some excellent geek out moments (TigerSharks and Mon-Starr! ), a great fight scene and the further expanding of the mythos, and you have an episode that was really fantastic, and nearly perfect. All times are GMT -4. The time now is 9:19 AM.